Home Rush my dread fall! 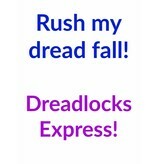 Rush my dread fall - the affordable way to get your dreads hair piece quicker! Please note that this express option is available for regular dread falls with hair-tie attachment and without any extra decorations (only exception are peacock feathers) only. It does not apply to any clip-in dreadlocks offer, they have extra rush options. We make all dread hair falls to order and include 3-4 business days in our delivery time for this process. Adding this upgrade to your dread fall order, will reduce the delivery time for your country by 3-4 business days, because we will make and ship your dread fall still the same day (for very early orders only) or it's the first order we make the business day after your order! Your order and payment must reach us before 3:00 PM CET (= Central European Time, we are in Cologne, Germany) to qualify for next day shipping. If we receive your order and payment before 9:00 AM CET, we might even be able to make and ship it the same day. You can check our time by asking google for CET or local time in Germany. This upgrade is good for a single dread fall or a dread fall pair. If you need two dread falls of two different models (= colors), you must add this upgrade two times. must be added PER dread fall of your order. This upgrade does not apply to clip-in dreadlocks which have extra listings, it refers to dread falls with hair-tie attachment only. Don't buy this upgrade without a dread fall, this does not make any sense :)! If you wish to order more items than dread falls, please place two orders, because we must ship your dread falls seperately.